A scary single dragon with its mouth widely opened ready to spit fire is a great sign of toughness. The black dragon coiling itself from the lower parts of the back to the neck areas is frightening to look at and can be used show the daring nature of the wearer. A scary pair bird wings which are synonymous with popular horror movies portrayed in a frightening way with a missing head and body are a sign of bravado. 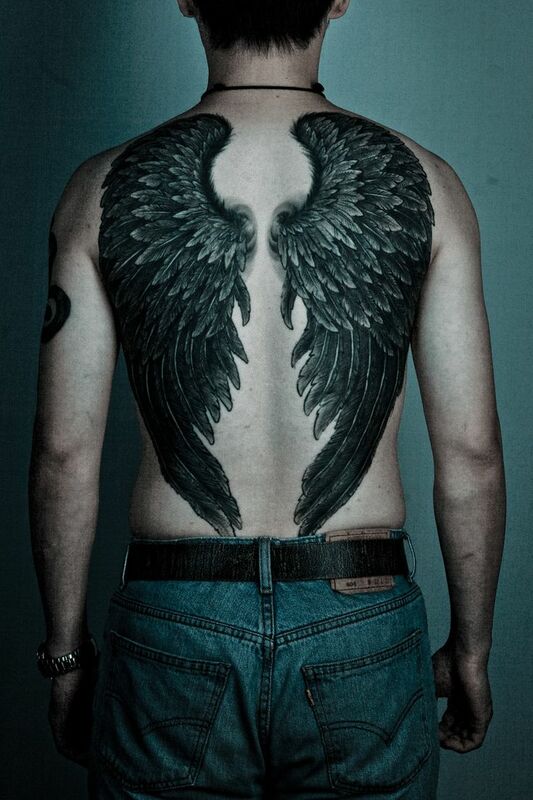 Apart from scaring viewers, the wings also tell a lot about how daring the tattoo wearer is in living his life. 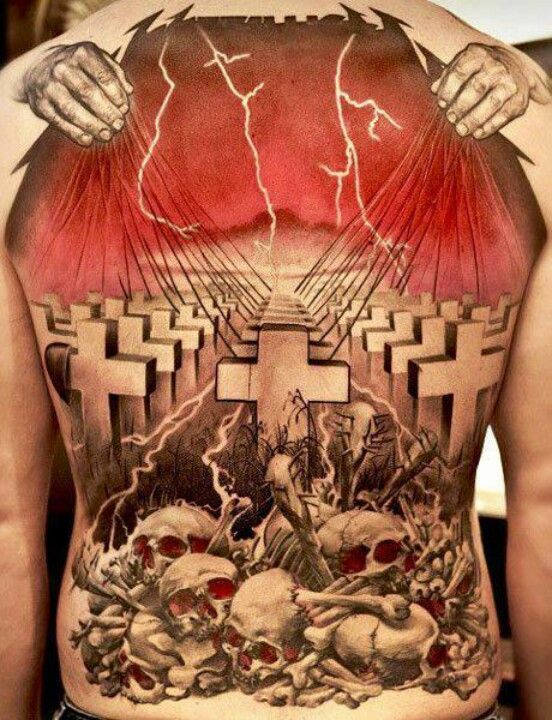 A scary tattoo of hell fire consuming the dead with thunder and lightning at far distance is a sign of boldness and readiness to face the wrath of God after spending your time on earth sinning. 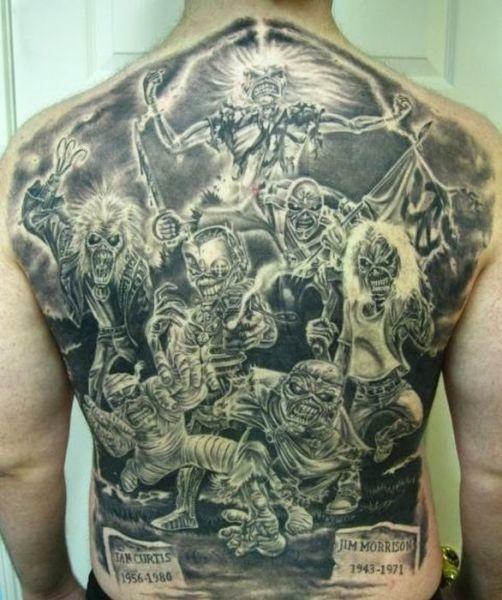 The scary portrait also shows human skulls and skeletons that only the bravest can allow a tattooist to put at their body back. The American eagle with thirteen stars of the confederate forces during the American civil war is a sign of defiance. 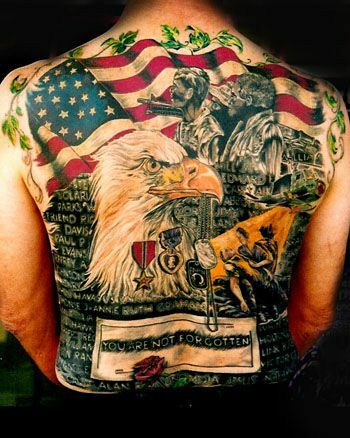 Although there are signs of patriotism by including the eagle and some elements of the American flag, the main aim by the tattoo wearer is to show defiance. 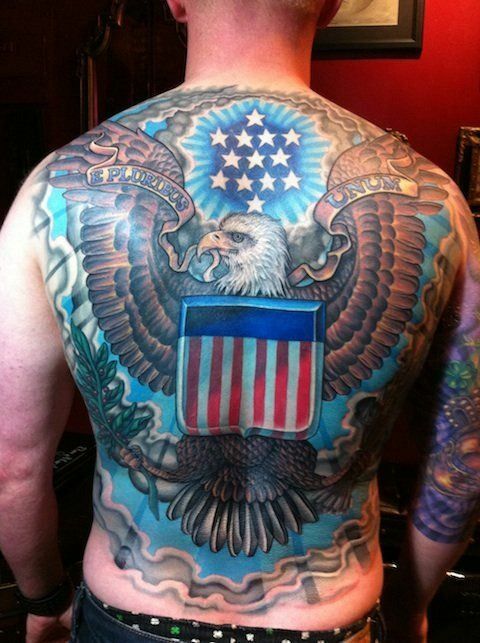 A clear show of patriotism in a colorful way, this back tattoo with the American eagle creatively crafted at the forefront and the American flag at the rear part is a show of patriotism and love for one’s country. Is this a dancing dragon? It appears so; this back tattoo shows male bravado in a little-scary way by placing the petrifying dragon in a dancing mood. 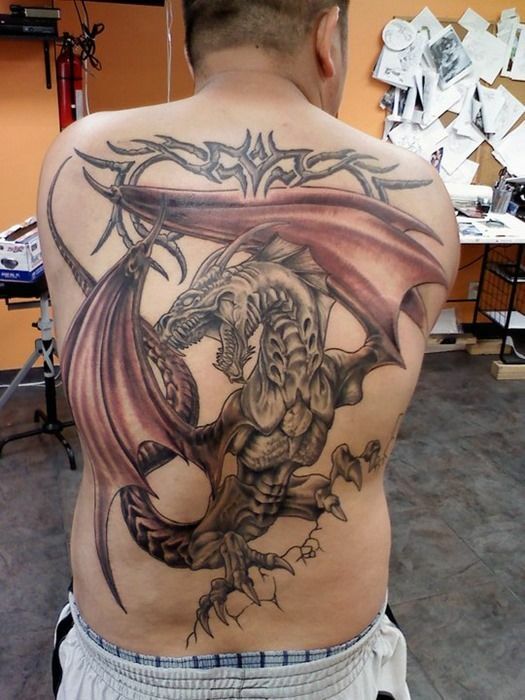 It is a tattoo for dragon-lovers who fo not pass out their message in a scary way. A combination of skeleton characters that are seemingly in distress somewhere in hell with one of the characters, perhaps the devil seated at central position is very frightening. The tattoo shows how fearless the wearer is and passes a clear message about how hell is will be distressful. 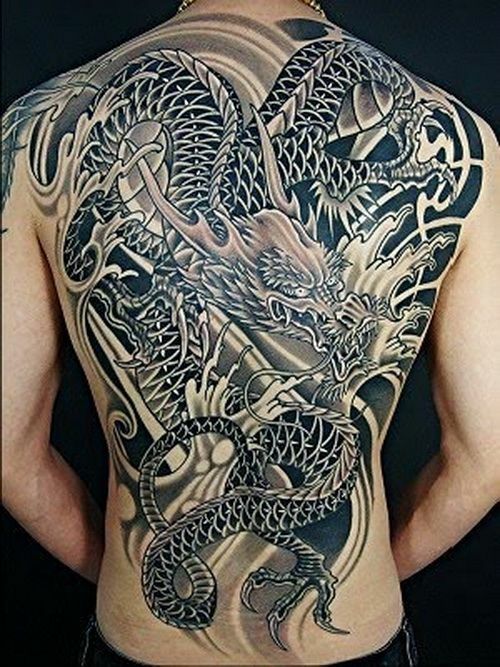 This is a popular tattoo of intertwined dragons that are popular among the Japanese Yakuza and Samurai warriors. 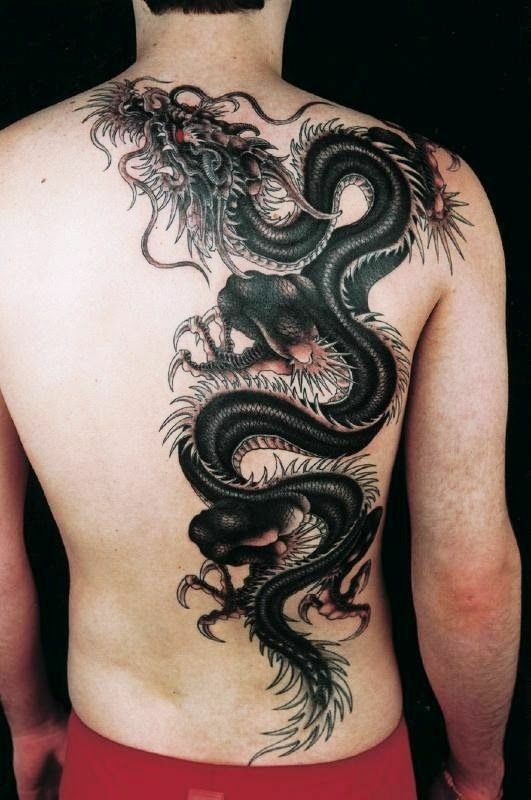 The dragons interlock to form a formidable pattern of good-looking tattoo that is charming for viewers. The dragons symbolize male masculinity and bravery. A scary decoration of some religious occurrence such as this, show a lot of boldness. 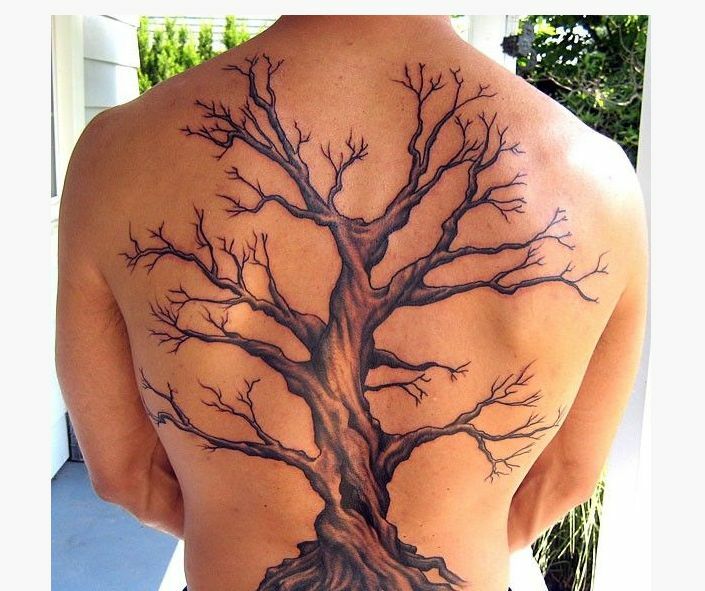 The tattoo shows numerous visions with an opening that goes up and wide onto the collar bone edges. This is frightening and only a few people can be able to gather up strength and look at it twice. A dry tree that has shed off its leaves but still looks strong is a clear sign of male dominance even in instances that does not favor his supremacy. The tree, although a bit scary shows a form of continuity as it is standing tall even in dry weather.